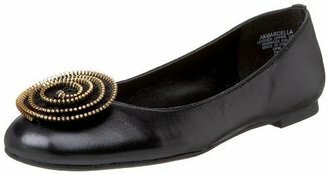 Sweet with an edge, these AK Anne Klein Marcella flats feature a zipper-flower embellishment and sell for $69.95 at Endless.com. They also come in purple or teal leather. Newport News offers a similar look for less with their Zipper corsage flats in faux leather, on sale now for $29. Click any image to purchase. These are so close! They are very cute and right on trend with the zippers.